That's funny:). Can you eat them in a salad? Bread and Butter pickles are usually made from slices. You might try a refrigerator pickle too. Woah, you're not kidding about monster size! Have you ever tried cucumber salad? It's just thinly sliced cucumber with some sort of vinegar concoction mixed in. Sorry, I don't know a recipe, but my family used to make it and I loved it. Or maybe a Greek salad with cucumber, tomatoes, olives and feta cheese? Actually I do. You can slice them, dip them in batter and fry them. Thanks for all the suggestions - I'm sure I will be trying every single one before the summer is over! I've made this batch into refrigerator pickles, following a recipe posted by Daphne over on her blog. This happened to me too! I swear I just missed picking them for a day, but then again maybe the fact that the previous two days I was picking by flashlight because of working late means that's not the most successful way to go about it... And mine have big bad spines. I was going to try to pickle them the same as my actual cornichon-sized cornichon (i.e. just throw them in the fridge in some vinegar, garlic, thyme, black pepper) but sliced. We'll see! 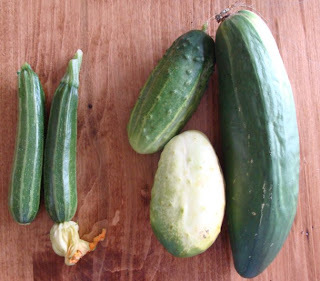 I am posting this comment several years after you wrote about the cucumbers as I just found this blog (which I am now reading in chronological order (not sure about that spelling!). Here is one of my favorite cucumber salads. Take a big spoonful of sour cream, add a little lemon juice and a little sugar. If you like them, add a little chopped green peppers and chopped onion. Add any herbs you like. Stir. Slice cucumbers very thinly and stir into the sour cream sauce and chill about an hour before serving. I have never made this salad the same way twice - sometimes I have more peppers and onion; sometimes I have none. The salad does get watery after a day or two so don't make more than you can eat in one or two meals.